Whenever we build a website no matter what is the niche or purpose of the website but a contact form is must be needed. The contact form used to connect us with the customer, visitor or well-wisher. For the security reason or being safe, it’s not a wise decision to publish personal email on the website that’s why a contact form works like magic which one can prevent spam or any unwanted email. Also, a contact form can be very useful to receive an email as per your expectation or required subject line. In this article, we have listed Top Freemium(Free & Premium) Contact Form plugins for WordPress in 2019 with popular features. Most popular contact form plugin in the WordPress plugin repository. The plugin has 5+ million active installations with 84% ratings. You can create and manage multiple contact forms, plus you can customize the form and the mail contents flexibly with simple markup. The plugin comes with a pre-made simple contact form. The form supports Ajax-powered submitting, CAPTCHA, Akismet spam filtering and so on. Contact Form 7 is one of the best contact form plugins for WordPress which is extremely easy to place anywhere with shortcode. If you are looking for a contact form with the minimalist design then Contact form 7 is the perfect suit for you. WPForm is another great plugin that comes with some cool and powerful pre-made templates, payment integrations and multi-step functionalities. The plugin allows you to create beautiful contact forms, subscription forms, payment forms, and other types of forms for your site in minutes, not hours! The FREE version enough as 100% mobile responsive contact form solution, so your contact forms will always look great on all devices (mobile, tablet, laptop, and desktop). If you are looking for more advanced features then don’t hesitate to grab the PREMIUM plan that starts from only $39. Ninja form is a gorgeous and intuitive user interface rich plugin that comes with NO LIMITATIONS. You can use the unlimited number of forms, fields, emails, actions, or submissions. The plugin also has several native integrations with popular email service providers(like MailChimp, AWeber) as well as payment processors. The FREE version of the plugin also takes care of managing form submissions for you right within the website admin dashboard. PREMIUM version of the plugin is more popular as it starts with only $29 with a lot of additional features and add-ons. Formidable Forms is another great plugin if you’re looking for a free or premium option for a contact form plugin. The plugin has an over 200,000+ active installs with a 4.5 out of 5-star rating. Easy to use drag & drop WordPress form builder plugin to create contact forms, surveys, quiz forms, registration forms, payment forms, purchase forms, email marketing forms, and just about any other form you can imagine. The FREE version is great for a basic contact or subscription form whereas the Premium version comes with a lot of advanced features. 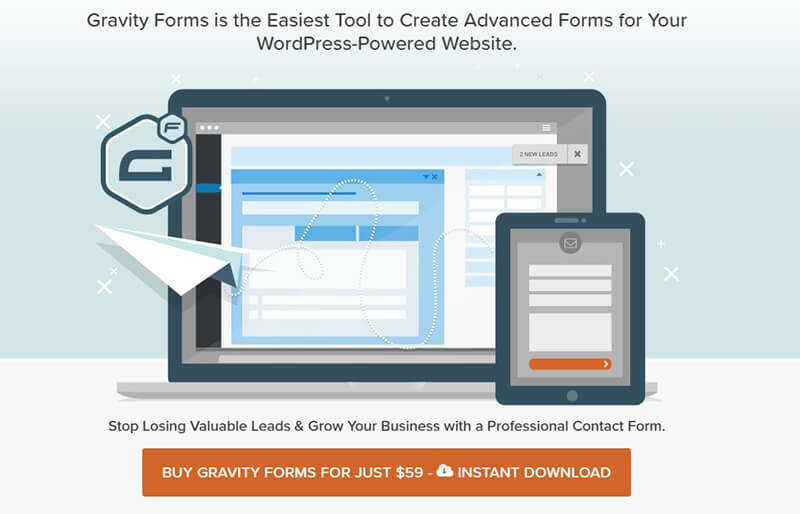 Gravity form is much popular in WordPress advanced contact form plugin category though the pugin comes as premium only and starts from $59 a year. You can build and publish your WordPress forms in just minutes. No drudgery, just quick and easy form-building process. Select your fields, configure your options and easily embed forms on your WordPress-powered site using the built-in tools. Gravity form has more popular and useful advanced features to integrate library with email software, automation software like Zapier, and payment processors like Stripe and PayPal so you can accept payment with your forms. Check out their features and pricing. Caldera Form is a freemium and powerful WordPress plugin that creates responsive forms with a simple drag and drop visual builder. The plugin has many free user-friendly add-ons for both beginners user and professional web developers. The FREE version enriches with all necessary fields to create a basic form whereas advanced fields are available in PREMIUM version along with add-ons. The PREMIUM plan starts at $74.99 per year. Everest Forms is designed keeping in mind usability and simplicity. Everest Forms plugin provides an easy way to create any kind of forms including contact forms, subscription forms. Drag and Drop form builder make ordering and creating forms so easy that even a beginner to WordPress can create beautiful forms within a couple of minutes. 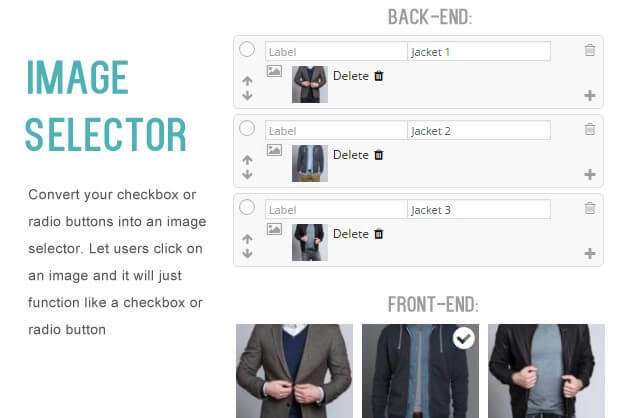 The plugin is very lightweight, fast, extendible with add-ons and 100% mobile responsive. Premium version starts from $29. Check all features, addons and pricing. CaptainForm comes with the superpower of the contact form. CaptainForm provides advanced functionality in an easy to use, drag and drop friendly interface. Captain Form is integrated with many apps and payment processors you usually need, such as Google Drive, Dropbox, MailChimp, Active Campaign, SalesForce, PayPal, Stripe, Authorize.net, Braintree, Sage Pay and many more. FREE version is limited with 15 fields/form, 500 submissions/month whereas PREMIUM version starts with a lot of advanced opportunities at $35 per year. weForm is a lightweight drag and drop contact form builder plugin. It’s minimalistic design is not only modern but also super fast and easy to use. The plugin has Premium version as well starts from $39 per year although the free version includes quite a few good features, including being able to see contact form submission data in the WordPress admin dashboard. Conditional logic, Multiple Step Forms and so on.. The FREE version is great for a basic contact form with 20+ fields whereas the PREMIUM version comes with a lot of advanced features starts at $39 per year. Contact Bank is the ultimate FREE straight-forward form creation plugin for WordPress. You can build forms within minutes using a simple yet powerful drag-and-drop visual fomr builder. Anyone can build a contact form using couple of click without any coding knowledge. Though it’s FREE but PREMIUM version enriches with more advanced features, don’t miss to check the features first. NEX-Forms is a master combination of 50+ form fields, conditional logic, math logic, responsive, multi-step forms, drag and drop, full bootstrap grid system, confirmation email setup, and many more features. The plugin is high quality and simple to use drag and drop form builder with the opportunity of customizability, flexibility, design, and usability that will make online form building a walk in the park. The FREE version isn’t popular but PREMIUM version looks awesome with 7,460+ sales on Codecanyon. If you are looking for an advanced featured plugin for creating a complex form then Quform is built for you. The plugin will give you a complete overhaul. You can build multiple forms with full control to edit anything you want without any coding knowledge. It’s a simple plugin with the most updated features. Sold over 23,530 times in Codecanyon. You can buy the plugin from Codecanyon for only $29 and you will get future updates for free. So, No yearly renew or add-on issue at all. You can understand the popularity of the plugin just knowing that the plugin is sold over 3,780 times in Codecanyon with 200+ 5-Start rating. Ninja Kick WordPress contact form plugin comes with 3 beautiful themes, social bar, Mailchimp integration and extensive customization on design. This lightweight plugin uses modern CSS3 transitions, has layout responsive to cope with screen changes and cross-browser compatible. As you are buying the plugin from Codecanyon for only $19 so you will get future updates for free. So, No yearly renew or add-on issue as well. One of the popular contact form plugin to build any complex, logical or multi-step form. As usual, for building an advanced form you don’t need any coding experience whereas the plugin already enriched with good documentation. You will get all important field and advanced options to build any kind of form. ARForms has a unique UI, designed to give users a real-time experience, and it’s packed with powerful features so that you can prepare and process your forms at lightning speed. The plugin is regularly updating as per the WordPress update and trends. Check all the features on Codecanyon. HappyForms is focused on making really easy the process of creating basic contact forms, with it you can easily handle, edit or customize a form design where all the power on your hand – just name it to apply. You can easily manage and respond to conversations with customers smoothly with this lightweight plugin. If you are looking for a plugin for free with enough good field then you should have a try HappyForms. HappyForms has over 10,000+ active installations with a beautiful five five-star rating. So, the plugin worths a try before you decide any FREE plugin. Smart Forms is one of the very user-friendly plugin when it comes to building forms. With unlimited options, you will be able to build and any kind of forms. You will get conditional logic, Multipart elements and tons of customizable options and settings to fit your needs. No matter what theme you have installed Smart Forms will fit with its color scheme functionality. This is the lowest PREMIUM plugin on our list, only $11. Check all the features from Codecanyon. Super Forms is a responsive professional form builder with a clean consistent Form UI. The plugins includes a variety of form Widgets such as Datepickers, Time pickers, Monthpickers, Colorpickers, Numeric Steppers, toggle switches validation, masking among other features. Super Forms – Drag & Drop + Column / Grid System is available on Codecanyon for $36, sold over 3,430 times. We have listed 17 best FREE & PREMIUM contact form plugin though there are 100+ contact form plugins available in the market. We have selected the best and now it’s your turn to choose the right plugin as per your needs. Over several years, you may be using Contact form 7 but it’s time to have a try if you are bored with Contact form 7 or want to taste something different. Good luck to you and thanks for your time to read the article. No matter if you like our list or not but you can always tell us which plugin you are using for your crucial contact page so we learn and share the experience with each other.